Phang Nga Bay is present between the mainland of Malay Peninsula and island of Phuket. The place is known for its beautiful Andaman sea, its collapsed caves, amazing lime stones, freakishly shaped rocks, many tiny beaches and the opportunities for having a wonderful summer experience with snorkeling, swimming or just relaxing on the beach. Apart from being famous due to this aesthetic beauty, Phang Nga Bay is also famous for its iconic role in different Hollywood movies. One of the most famous islands here is called James Bond Island named after the lead actor ever since the movie came out in 1974. This bay also appeared in Star Wars III- Revenge of the Sith. It was also used as a backdrop for planet Kashyyyk. However, this site was famous long before its introduction in Hollywood movies. The limestones cliffs, multiple caves, beautiful forests, habitat for several endangered species and collapsed cave system has made it the center of attention for many years. Many centuries ago, the sea levels were so low that the distance from Phuket to Kabi could be covered by mere walking however now the place comprises of the spectacular bay with natural beauty, beaches and several other activities including snorkeling, swimming etc for people who like adventures. This area is also famous for the co-existing for diverse local communities. These people are also engaged in various activities like harvesting Nypa palm fronds to use in thatching, fishing etc. They are also wonderful hosts to the tourist that come from all around the world to visit this bay. 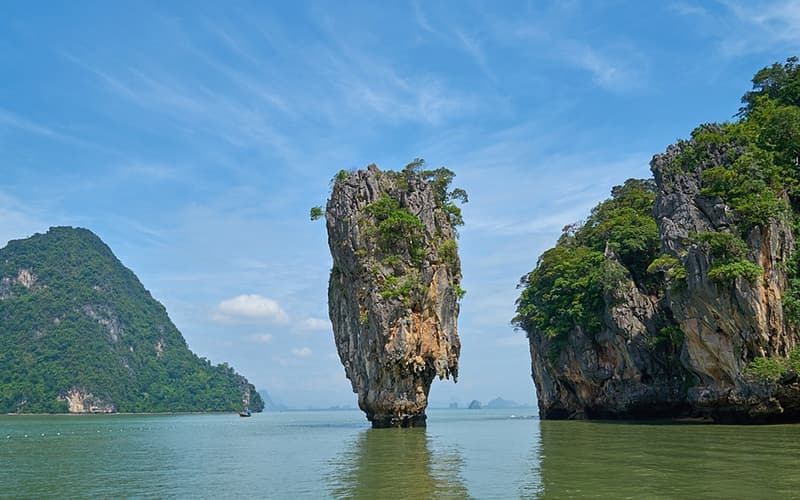 The bays are popular for its various sites including James Bond Island (named so as it was present in the shooting of The Man with Golden Gun, one of James Bond's movies). Apart from this Hong Islands, Phi Phi islands and Koh Panyee are also very famous due to their appearance. All these wonderful sites are accessible by longtail boats, Chinese junk boats or catamarans. These boats take you to your destination through fresh and clear water where you can also enjoy looking at marine animals and amazing birds. The tour provides opportunities for snorkeling, swimming, sunbathing or simply enjoying a delicious meal on the deck. Bay tours are well-suited for active travelers and families. As mentioned, Koh Panyee has a Muslim village, if you are planning to visit it, dress modestly. 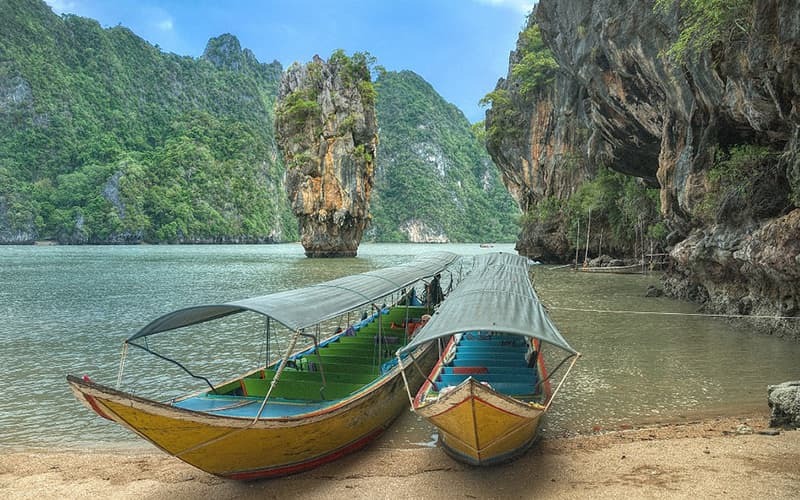 The easiest route to visit is through boating because the location of Phang Nga Bay is in the Andaman Sea which is present between Phuket and the mainland of southern Thailand. Rides are usually available from Phuket and Krabi, hotel dropoff and pickups are included in these rides. A good weather is important to make all your visit plans work. The summers are a good time starting from March to June, due to its location the weather is very optimal. A lot of people also prefer to visit during winters i.e. from November to February. However, it is strongly recommended not to travel during rainy seasons as it can ruin your plans. Prices are usually increased during high seasons, so if you are traveling on a budget it's better to opt for other times. A good view is one of the most special things to make a visit memorable. To have a stunning view of Phang Nga Bay, The Samet Nangshe is considered as the best site viewing place. It's location on a hill, which is just 30 minutes by car from Phuket, guarantees a full 180-degree view of the breathtaking sunrise. It is guaranteed to give you such a peace that you want to sit there for hours. Ao Phang National Park in was created by a royal verdict on April 29, 1981, in the province of Phang. It was announced under assertion 98, section 64 in the Royal Gazette on that date. Overall, most of the parts of the park are situated in a certain area called Andaman Sea. Which consists of several limestone tower karst islands which are breathtaking to watch. However, the most interesting and famous for tourist attraction site is Khao Phing Kan, famously nick-named James Bond Island, since James bond filmed some scenes from his movie, The Man with Golden Gun here. A lot of the people come from different areas of the world to visit the magnificent park along with this famous island. The park is also known to be inhabitant for Thailand mangrove forest, the largest mangrove forest to exist. 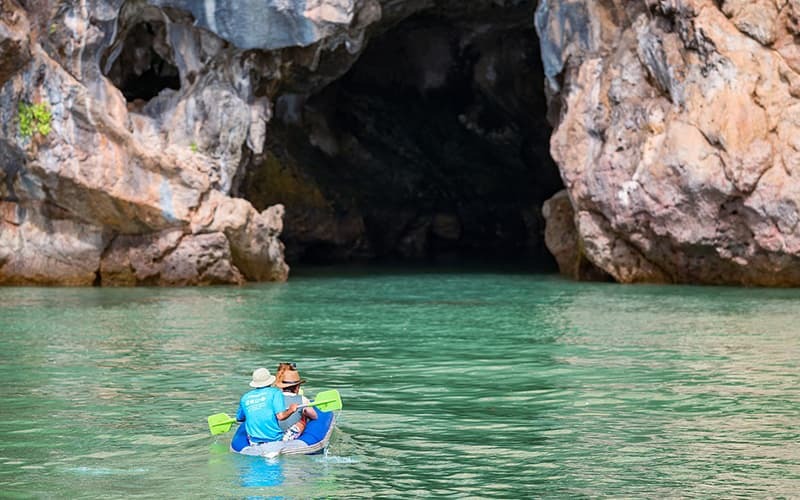 Another wonderful area to visit is Phang Nga Bay Marine National Park which was stated a Ramsar site On August 14, 2002, which is an area of wetlands renowned to have international fame and recognition under the Ramsar Convention. The area comprises of 42 uniquely beautiful islands with a shallow bay. This park is home to shallow marine water as well as 28 different species of mangrove which consist of striking seagrass beds and coral reef. It is interesting to know that along with 28 amazing species of mangrove there are also 88 species of birds, 82 types of fish, 18 reptiles, three amphibians, and 17 uniquely wonderful mammals i.e. the endangered serow, the white-hand gibbon, black finless porpoise, Malaysian Plover, the dugong, and Asiatic Dowitcher. Apart from their beautiful appearance, these mammals possess more importance due to endangerment. These mammals are kept with special care to ensure a healthy, long life. It is recommended that you leave the island early to enjoy the beautiful marine surrounding before other visitors arrive and the island gets all crowded. After enjoying the peaceful island, you are then taken away to Hong Island where you can kayak on a beautiful emerald green lagoon with complete relaxation. While kayaking, you can witness some amazing marine life especially silverfish; you can also see stunning birds flying their way home. After this, you are taken to visit Panak Island that has Lagoon Cave and Diamond Cave, which is again a memorable sight to watch. Later, you can return to your resort to enjoy the rest of your time there. Not quite what you are looking for? No problem. See more our Thailand tours. 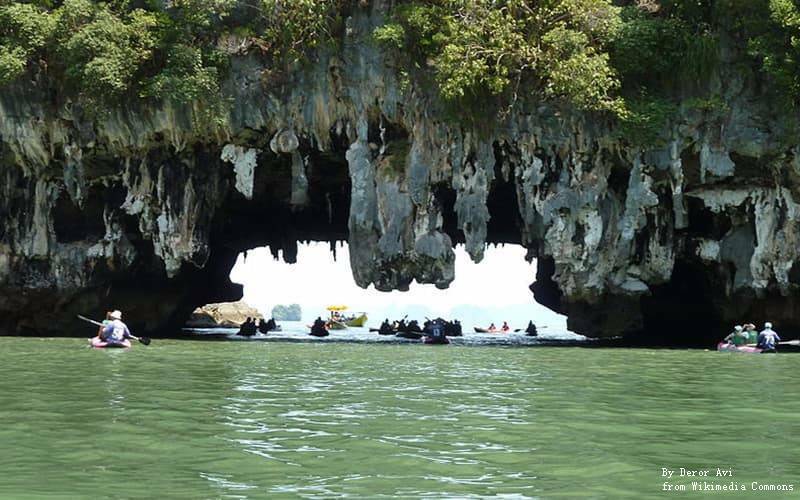 You can have us tailor-make your own Phang Nga Bay tour by telling us your interests and requirements.